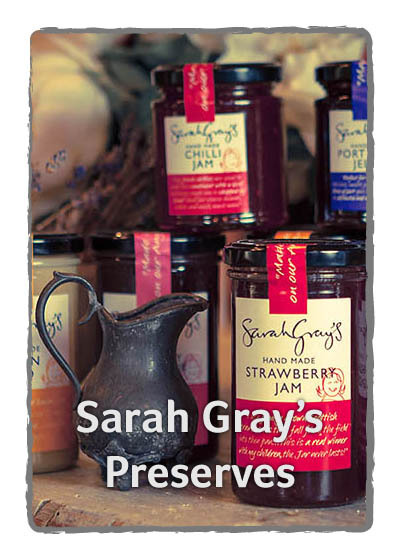 With my husband, I run 'Sarah Gray's' from our family kitchen in Angus where I make a range of jams, marmalades, jellies and curds. I make in small batches using locally sourced ingredients and tend to get my berries from our cousins only five miles away. Our three children are our inspiration and the reason we're dedicated to bringing you our range of delicious, hand made products. When I'm not running around after them, I can be found busy in the kitchen, keeping up with the already high demand! Each ingredient is carefully chosen to ensure the best flavour and texture. My newest products are lemon curd, lime curd and chilli jam which seem to be already very popular! Although I make a range of sweet jams and marmalades, I also make a couple of what I call cheeseboard companions... port wine jelly and spiced apple. 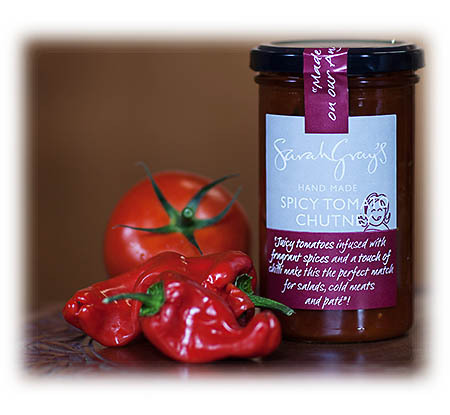 I have also just launched my new range of savoury chutneys which are ideal with oatcakes and cheese as well as an accompaniment to salads, pate and inside sandwiches and panini’s. I now make all of my products in 3kg catering sized pots for cafes and restaurants and also can supply in mini 35g jars also. Just get in touch to find out more. 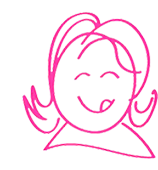 "I use family grown Scottish raspberries, sourced only five miles away from our farm. 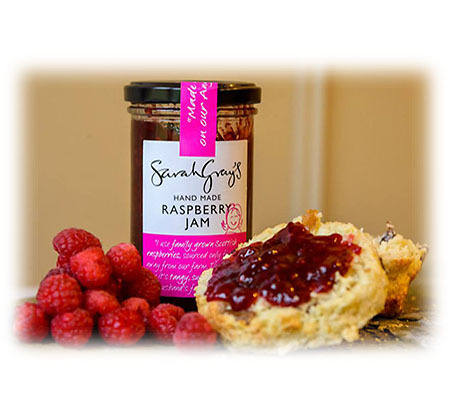 Theyt give the jam it's tangy, succulent flavour...my husband's favourite by far!!" "Go on... kill your curiosity. 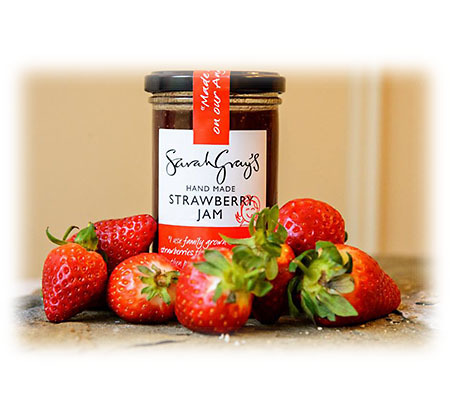 This sweet jam is ideal on toast or scones. 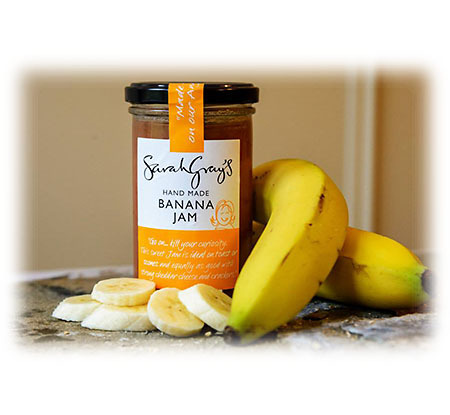 The bananas are sourced when they are at their ripest which makes this my sweetest jam yet." "I use family grown Scottish strawberries that fall from the field into the pan...this is a real winner with my children, the jar never lasts long in our house!" 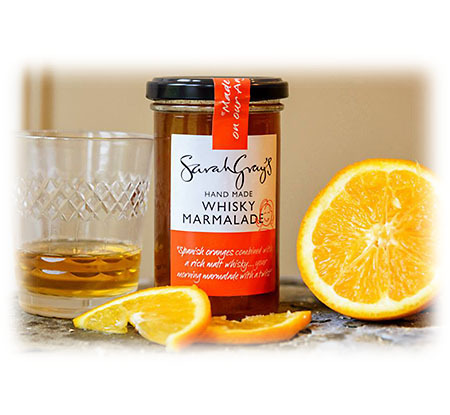 "Spanish oranges combined with a rich malt whisky make this marmalade truly delicious. Adding a kick to your morning toast!" 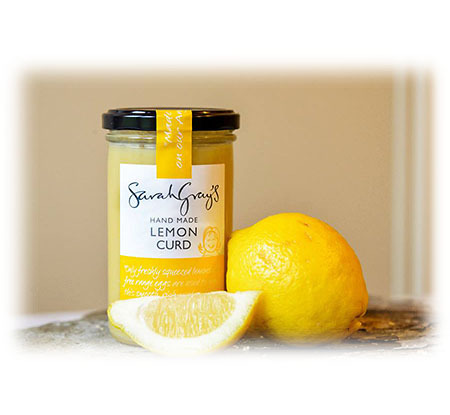 "Only freshly squeezed lemons and free range eggs are used to make this smooth, rich curd...ideal on toast or crumpets." 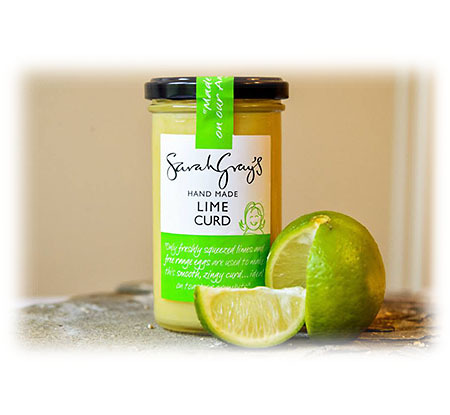 "Only freshly squeezed limes and free range eggs are used to make this smooth, zingy curd...ideal on toast or crumpets." 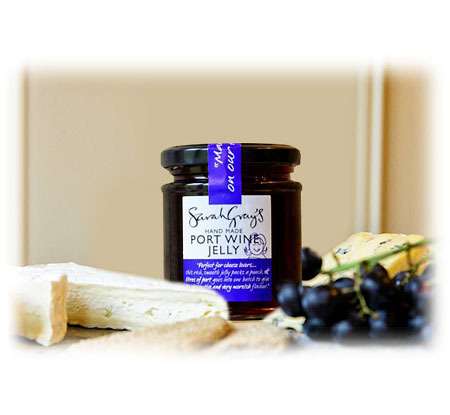 "Perfect for cheese lovers.. this rich, smooth jelly packs a punch. 18 litres of port goes into one batch. This is ideal with most types of cheese as well as a great accompaniment to steak or roast beef..yum!" 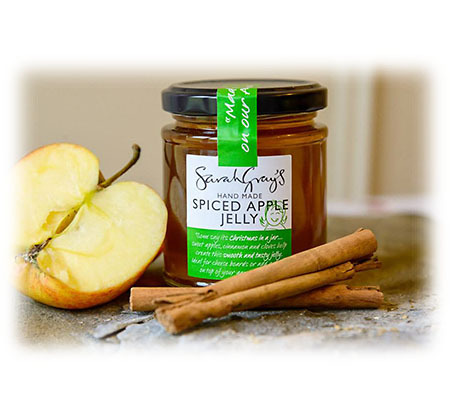 "Some say it's Christmas in a jar... sweet apples, cinnamon and cloves help create this smooth and tasty jelly. 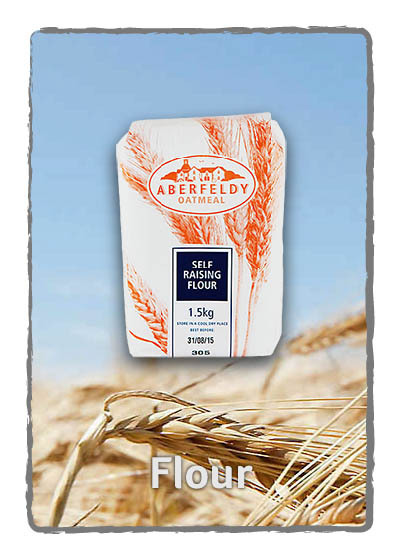 Ideal with a strong cheddar or an accompaniment to gammon steaks or sausages." 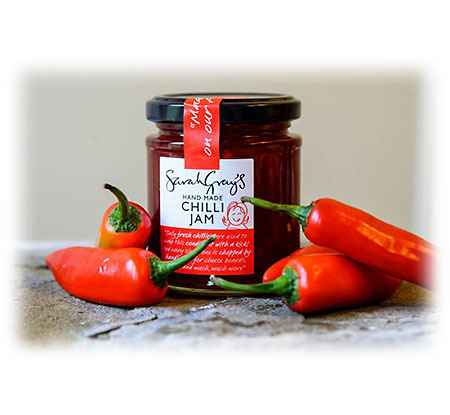 "Only our home grown Scottish fresh chillies are used to make this condiment with a kick! Great accompaniment with cheese. We find this jam very versatile. Use it with cheese, salads, inside panini’s and sandwiches as well as making a delicious sticky glaze on chicken or beef." 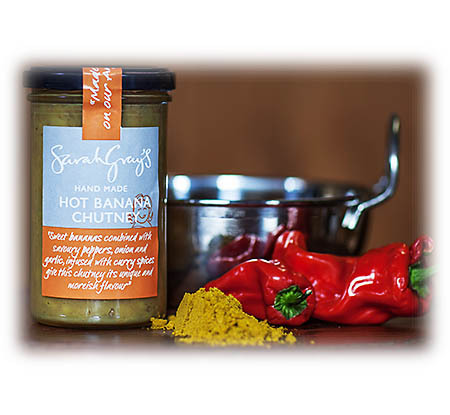 I have recently added a selection of savoury chutneys to my range to be enjoyed with cheese and meats. 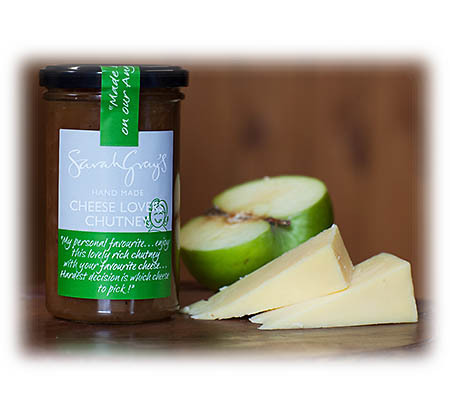 "Bramley apples, onion, fresh garlic and ginger along with juicy sultanas make this chutney the perfect companion to most types of cheese. Its also delicious inside a ham roll or inside a cheese toastie." "Juicy tomatoes, onions ,green chillies and spices make this a tasty accompaniment to most meats, pate and also with cheese and oatcakes. 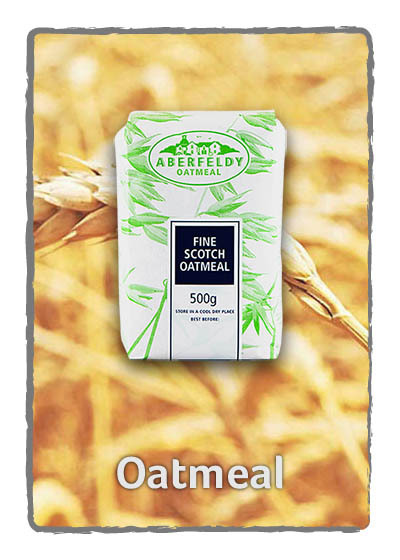 Ideal added to stir fry chicken or beef to create a spicy, savoury sauce." "Fresh bananas, onions, chillies and curry spices make this chutney a tasty accompaniment to thickly carved ham, steamed chicken or ideal inside a panini or roll. " 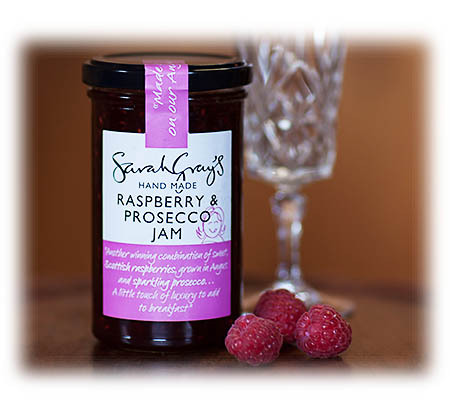 "The ideal mix of fresh Scottish raspberries grown only five miles from our farm combined with fruity, bubbly prosecco. The perfect match! " 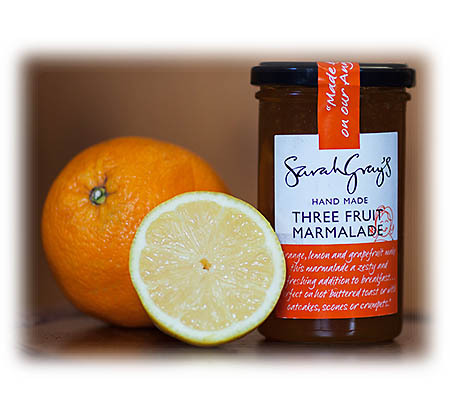 "Lemon, orange and grapefruit make this a zesty and fresh marmalade. 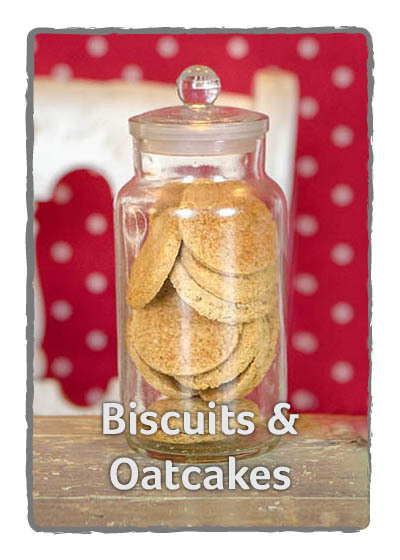 Perfect on toast, scones and oatcakes. "